The Stonemaul Clan had lived in the Eastern Kingdoms since the Second War, but they split in two prior to the emergence of the Scourge. Half of the clan traveled to Kalimdor to escape their enemies, but their problems were only beginning. The first problem was the ogre Kor’gall. A lesser member of the clan, he discovered the legendary axe Serathil and battled his way into power. As chieftain, he proved himself a tyrant, slaughtering any who disagreed with him. This would be his downfall, however, as one ogre escaped his wrath and met the Mok’Nathal Rexxar. Already having made a name for himself in the Horde, Rexxar sought to save the Stonemaul and perhaps gather their help against the Horde’s foes. Kor’gall proved a clever foe and nearly slew Rexxar. Rexxar was no fool himself, however, and eventually defeated Kor’gall’s traps and challenged him for leadership. Despite his strength, Kor’gall finally fell, and the Stonemaul Ogres cheered for Rexxar. When he requested their help in the fight against Admiral Proudmoore’s forces, they gladly accepted. After Admiral Daelin was killed and the Kul Tiras forces were scattered, however, Rexxar departed. In his stead, he appointed the ogre Mok’Morokk to be leader of the Stonemaul Clan. Mok’Morokk was fair at first, but as he realized the benefits of power, he began to grow into the very tyrant that Rexxar slew to save the clan. It wasn’t long before the black dragonflight raided the Stonemaul Village. Mok’Morokk did not fight back and fled as his people were killed around him. The surviving ogres settled in the village of Brackenwall, but they were not content. Many wished to reclaim their homes from the dragons, but Mok’Morokk was too cowardly to risk his new comfort. A cunning mage, Draz’zilb, recruited the help of a Horde adventurer to finally challenge and oust Mok’Morokk in favor of the aged but wiser Tharg. Mok’Morokk continued to ignore the plights of his people, and wanted the adventurer to search the ruins for only his own treasures he left behind. Following Draz’zilb’s plan, the adventurer challenged Mok’Morokk, and seeing his death approaching, he escaped the battle and disappeared into the swamp. Tharg found himself too apathetic to take the mantle of leadership however, and still mourns the wife he lost in the dragon massacre. With the Stonemaul Clan in turmoil, there are whispers that Mok’Morokk has not forgotten about being brought shame by the Horde. The player arrives on a swamp road leading up to Brackenwall Village. You and a group of Nath’s servants enter Brackenwall and their emissary requests to meet with their leader. Draz’Zilb informs the group that Tharg is their leader, but Tharg refuses to deal with political matters. Draz’Zilb takes the group away and briefly explains the plight of their clan. The meeting is interrupted by loud noises outside. When Nath’s servants see the Legion at the walls, they figure they had been followed somehow by some remnants from Nath’s Spine. It isn’t long before the Stonemaul Clan points out that they are being led by a horrifically twisted Mok’Morokk. Mok’Morokk proudly explains how the Legion granted him more power than he thought even existed and wished to use it to get revenge. The player helps fight off the Legion, but when a rain of Infernals and Abyssals fill the town, the Stonemaul Clan is forced into a retreat. The player meets back up with the ogres in a makeshift camp some ways away. You spend some time searching for survivors, but when Draz’Zilb suggests that the ogres devise a counterattack, Tharg argues that the demonic hordes they face are even more dangerous than the black dragons that massacred them. Couriers are sent out to request assistance from the Horde, but you discover that Mok’Morokk has the swamp surrounded by the Legion when they are killed. Worse, the Stonemaul Clan discover to their dismay that they now occupy the ruins of their old village as well. The Legion attacks the refugee camp once more, and as they flee once more, Draz’Zilb is mortally wounded. At the next rest stop, Tharg blames himself and finally resolves to do something. He requests the player search the Stonemaul Ruins for an artifact that Rexxar left them. When it is brought back, Tharg activates it, and the howl of a great beast echoes throughout the swamp. By the power of some ancient magic of nature, Rexxar arrives at the call. Rexxar agrees to lead the ogres as they return to Brackenwall Village to reclaim it from Mok’Morokk and the Legion. When they arrive, however, the village has been burned to the ground. Rexxar, Tharg, and the player clear out the remaining demons, as well as a powerful Legion lieutenant, who reveals that Mok’Morokk left for the Stonemaul Ruins in his dying breath. In one final push, the Stonemaul Clan assault the ruins of their once proud home. Once the demons have been defeated, Mok’Morokk reveals that he captured Rexxar as he prowled the surrounding swamp, looking for a weakness in his defenses. Tharg and the player duel Mok’Morokk, and he is finally brought low. Tharg decides to not let Mok’Morokk escape this time, and the player frees Rexxar. Rexxar praises Tharg’s courage and leadership in the final battle, and hands him the legendary Serathil to wield as chieftain of the Stonemaul Clan. Tharg accepts the weapon with pride and vows to never let the Stonemaul fall to tyranny or apathy ever again. Rexxar promises to help rebuild Stonemaul Village as a great symbol of the clan’s strength, and while he says that he will once again return to his travels afterward, he also refreshes his oath to come to the Stonemaul’s aid should they ever need it again. When the phase ends, you move into the real Dustwallow Marsh. Here, Horde players spend their quests further securing the land for the Stonemaul ogres from the Grimtotem and other enemies, not to mention finally getting their revenge against the remaining black dragons. Our scrying spells have detected that this ogre clan is in dire straits despite the close proximity of their allies. Let us enter their village and see if we can lend any assistance. Defeat the demons filling the village. This is it, friend. Stonemaul Village will be ours once more. It’s crawling with horrific demons though. Let us descend upon the village and show them that we will not stand for their dessication of our land. I don’t care what kind of demons they are, just tear them apart. Then we will confront Mok’Morokk. This zone will be an instanced section of Dustwallow Marsh. 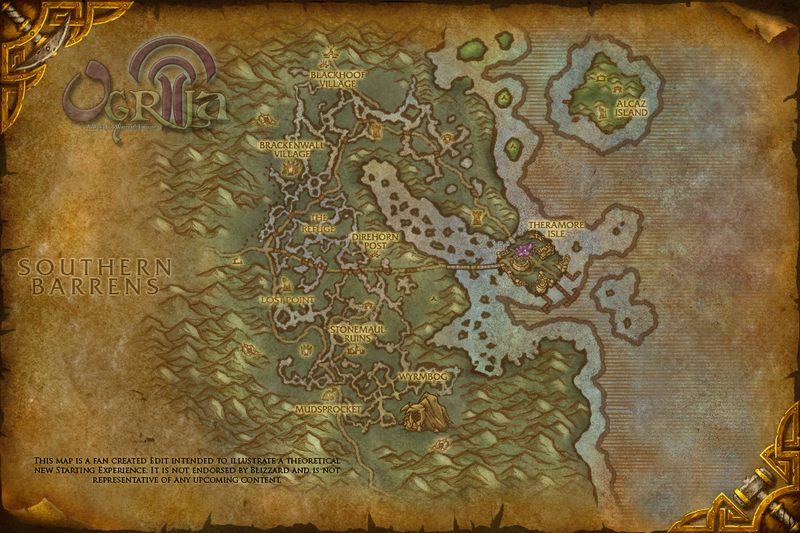 Due to the Burning Legion’s attacks, much of it will be cut off by fel fires and other barriers that prevent access or exposure to the Alliance and other forces in the area. The focus will be on a path between Brackenwall Village and the Stonemaul Ruins. There will be a couple of rest stops with familiar Dustwallow appearances, but the rest of the zone will appear as one under siege by the forces of the Burning Legion.